Staging Diva® and the Staging Diva logo are registered trademarks of Six Elements Inc., a company that is committed to protecting your privacy. We have provided this notice to explain our online information practices and the choices you can make about the way your information is collected and used. This notice applies only to the information collected on this web site, and does not apply to any other information Six Elements collects about you in other forums, such as through a “snail” mailing response, or over the phone. 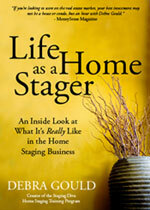 Staging Diva Graduate information is sometimes shared with homeowners and real estate agents looking for a home stager in their area. These referrals are only made with the permission of the Staging Diva Graduate. Homeowner/agent contact information is shared with Staging Diva Graduates in their area, only with specific permission when the homeowner or agent contacts us through the Staging Diva Home Stager Locator Service. Client testimonials are only used with permission. 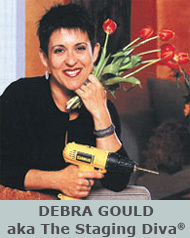 Home Staging Success Stories are not identified by client name unless used with permission. We have several different information collection areas on our site, from newsletter and quiz sign-up forms to training registration, orders for reports, ebooks or recordings. We collect the information we need to respond to your request, which typically includes such contact information as e-mail address, name, mailing address, and telephone. We use the information you provide to respond to your particular request, for example, to send you the newsletter in which you expressed an interest, or to have your training or other order fulfilled. We will also use your contact information to tell you about other events in which we believe you may be interested. 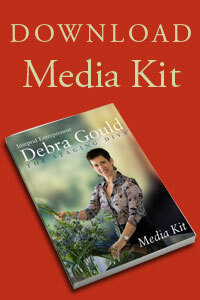 We never sell or share any of this information with third parties. You may have clicked on an ad for this website that was delivered by Google. Google measures the performance of the advertising it delivers. By providing a tool to more accurately measure the performance of the ads they deliver, Google (and advertisers) will be able to improve the quality and relevance of the ads that you see. You can also read answers to many common questions about our programs, home staging, how staging can help real estate agents in building their business, and the business of home staging throughout this site. 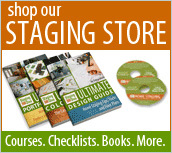 We want you to be satisfied with the Staging Diva and Six Elements products or services you order. If you don’t feel that our materials are as described on the order pages, we’ll give you a full refund. For downloadable courses, ebooks, special reports or checklists, refunds must be requested in writing within 48 hours of receiving materials. After that time no refunds will be issued. All refund requests must be submitted in writing, and at that time, any and all access to the digital materials will be terminated. For physical products (like the home study kit), refunds must be requested in writing within 45 days of ordering. At that time you will be given instructions for returning your materials. Once these are received by us, you will get a refund for your purchase (including shipping to you and taxes charged). We do not cover shipping costs to return your products to us. After the 45 days no refunds will be issued. All refund requests must be submitted in writing.